A program of monthly webcasts from intelligentgiving.com, the website that reviews UK charities and rates the quality of their public reporting. These webcasts aim to help charities improve every aspect of their operations. The emphasis is on giving down-to-earth advice, often by learning from the experience of other charities. 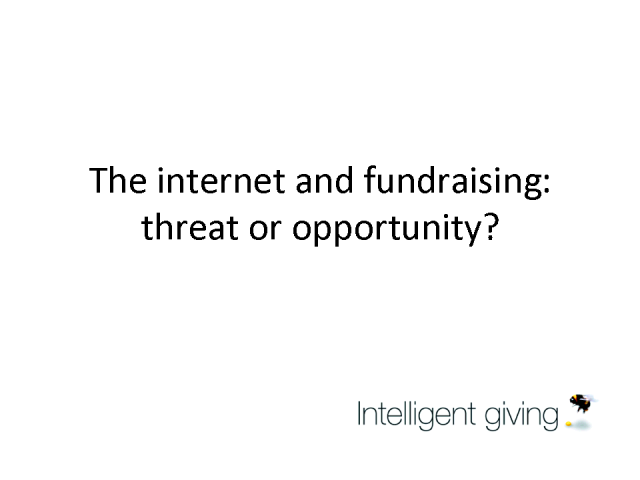 The Internet and fundraising: threat or opportunity? This free webinar will help charities understand the opportunities presented by the Internet and how they are best exploited using real-life examples. Topics covered will include: how to take advantage of free tools on the Internet; how social networking can dramatically improve the relationship between charities and donors; and how charities have successfully integrated their Internet and fundraising strategies.